Whether its picking a career, changing a career, or developing a career, understanding the MBTI and Myers-Briggs concepts of Personality Type can help navigate these waters. This article will share some of the ways I used MBTI ® results and MBTI data with my career counseling and career development clients. I'll cover this territory primarily for the benefit of the person whose is seeking career help. Understanding your Personality Type can assist your career development in a number of ways. It can help you select a career field that is a good fit for your personality make-up. It can increase your awareness of your learning style so you can better benefit from career related education. Understanding your personality preferences can help you better manage Job challenges that inevitably rise their ugly heads during the course of our career. Knowing your Personality Type, and especially knowing the kind of detailed information a Step II MBTI report can provide, will aid you in a job search, both in marketing yourself and in evaluating opportunities that arise. Unlike the Strong Interest Inventory (also a helpful tool for career planning), the MBTI wasn't designed as a career assessment test. However due to interests and efforts of Isabel Myers, her long time colleague Mary McCaulley, and the staff of the Center for Applications of Psychological Type (CAPT), a substantial amount of data has been collected on the personality types of many occupational categories. This information has been compiled into the CAPT Atlas of Type Tables and ". . . contains more than 300 type tables encompassing normative populations and career groups including art and communications, business and management, counseling, engineering, government, health, industry, religion, and students." The word "Atlas" is instructive as this is a 595 page tome that is intended to be a reference book for career counselors and MBTI researchers. I've recently been informed that the Atlas is out of print so I suggest trying the library or if you engage the services of an MBTI trained career counselor, this person may have a copy of the Atlas. An alternative publication that remains in print and available is the MBTI® Type Tables for Occupations, available from CAPT for $99.00. Step-By-Step Guide to Verifying your 4 Letter MBTI Personality Type. New Article: Gender Gap & Personality Type. Two more affordable publications on Myers-Briggs Personality Type and Careers are Introduction to Type and Careers by Allan Hammer and Looking at Type and Careers by Charles Martin. There is also a special version of the MBTI that provides a Career Report in additional to the standard MBTI ® Profile Report. 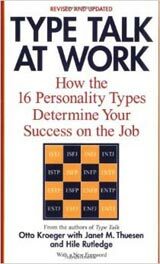 "According to type theory, MBTI Types would be distributed in occupations consistent with the characteristics of the work environments of those occupations. Occupations my both require and reward specific ways of perceiving information and making decisions on that information; thus different types would be expected to be attracted to different occupations." I might add that in addition to the nature of occupations "attracting" certain types there is also a culling process where certain types who discover their occupation is not suitable (with or without assistance from their employers!) will leave the occupation. So data on correlations between Type and Occupation can identify potentially good matches between the pattern of your personality and the requirements of an occupation. For example data from the Type Atlas for the ISTJ type indicates many of this type are drawn to occupations like: dentistry, auditing, accounting, mechanical engineering, math teaching, industrial arts teaching, and banking. Conversely the data suggests very few ISTJs are found among: the clergy, psychologists, journalists, marketing professionals, or professional photographers. The first set of data serves to highlight some potential occupations worth considering, while the second set of data suggests some caution (more about this later). While data such as that provided by the Type Atlas covers only a fraction of the thousands of available careers or occupations, often themes can be inferred from the most popular occupations that are recorded. In the case example above for ISTJs, it would be reasonable to infer that other occupations that regularly involve manipulation of data and numbers would be reasonably good fits for this type. At the other end of the spectrum, those occupations with a low correlation with a given type provide food for thought in the event an individual of that type was considering that as a career option. However, it is important to recognize that a low correlation ought not to veto a career alternative. This low correlation suggests that a person of a given type entering that occupation will bring an atypical tool set and perspective to that occupation and to his or her job. In some circumstances this atypical skill set or perspective may actually result in an exceptional contribution to the profession. So we need to be even-handed about this information. For example an ISTJ preference young person who thinks he wants to be a newspaper journalist should understand his particular perspective, values and approach to his profession will be different from many of his colleagues. However, he should also know that, while such differences can become working-life challenges, this uniqueness could be the wellspring of notable achievement. For mid-life career changers, these low correlation occupational and personality type associations sometimes help explain why a career has gone stale or why despite several years of experience and different employers/different work environments, career success and satisfaction remained out of reach. While the person may have come to accept that perhaps they have been a "round peg in a square hole" and need to change careers, many arrive at this conclusion also carrying some emotional baggage, a sense of failure, that they couldn't cut the mustard in this field or a sense of guilt for feeling the way they do. In my experience with career changers and in fact people who have simply had a tough time succeeding in the job market, understanding this delicate fit between their mostly innate personality patterns and the working demands of certain occupations and of certain job environments is essential. It is essential not only for selecting a "good fit" for the future, it is a key to understanding the past in a way that helps restore a person's self-confidence and optimism. Next Page - MBTI, Learning Style & Success. Here's an interesting video on "Changing Your Life" by humorist Adam Carolla. Funny, yet makes some important points. Learn more about Type Dynamics: The Dynamics of Type: Interpreting the MBTI ®Personality Type Code. Otto Kroeger was a close friend and associate of Isabel Myers and was a very popular speaker and educator on applying an understanding of Personality Type to our personal and working lives. Type Talk at Work is a classic, timeless, and easy to read. Will be quite helpful to anyone wanting to improve his or her work relationships.